But not everyone had the same idea of what “azure blue and maize” meant. The committee gave no examples and no standards on the exact shade and hue. 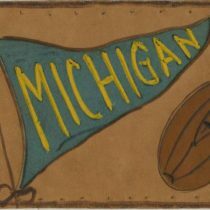 Variations appeared immediately, eventually resulting in multiple versions of the school banner on display in store windows throughout Ann Arbor. 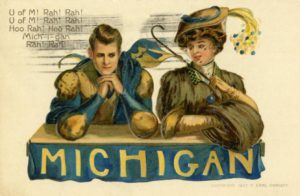 This division continued until 1912, when the Regents formed a new committee to reconcile the disparate colors in time for U-M’s 75th anniversary. In hopes of ending color drift, the committee chose maize and blue ribbons to be the exemplars for all official University of Michigan colors from then on. The ribbons now reside in the Bentley Historical Library’s archive. In 2015, the University launched a comprehensive branding campaign to ensure consistent use of logos and colors. The new standards are also archived at the Bentley—just in case they change again.